Ball Wide Mouth Jars that is. And – Not Tupperware – but Stay at Home Mom Tupperware commonly known as Left Over Sour Cream Containers with mismatched lids. 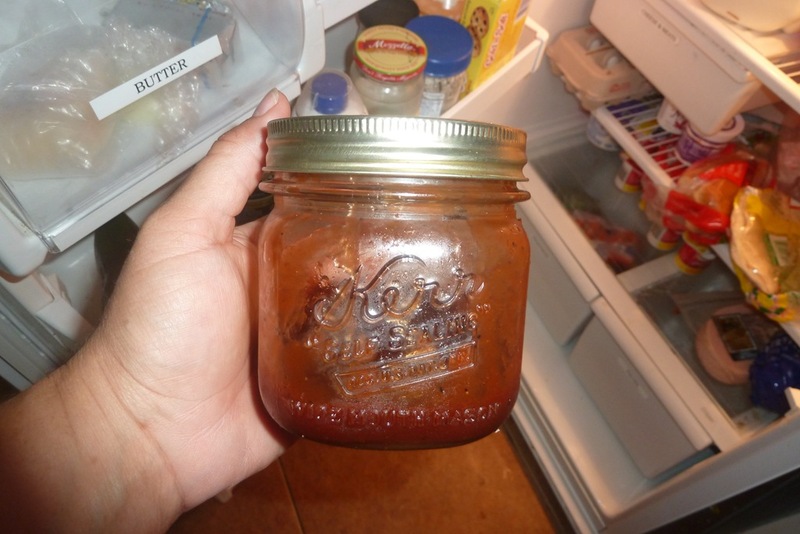 I started to store our leftovers in the clear Kerr and Ball jars. It seemed that they would get eaten, and not turn into science experiments. 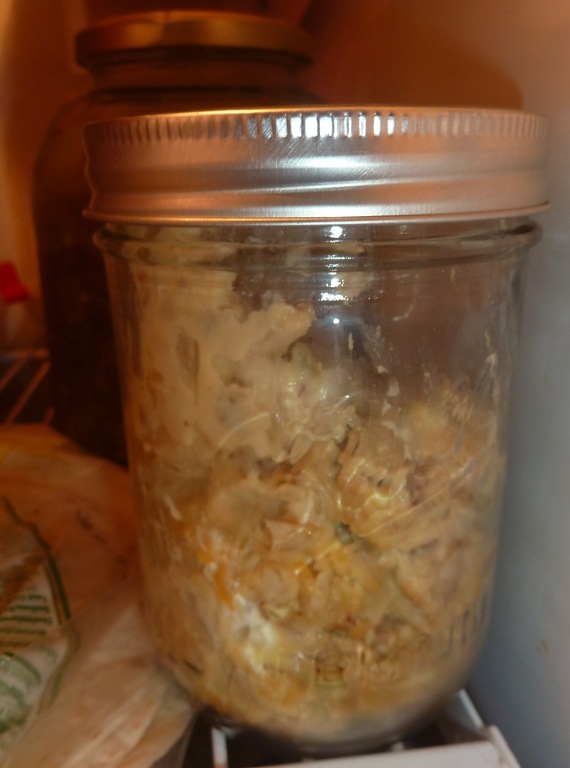 Chicken Enchilada Filling, stored in front with Tortillas – found their way to a snack. 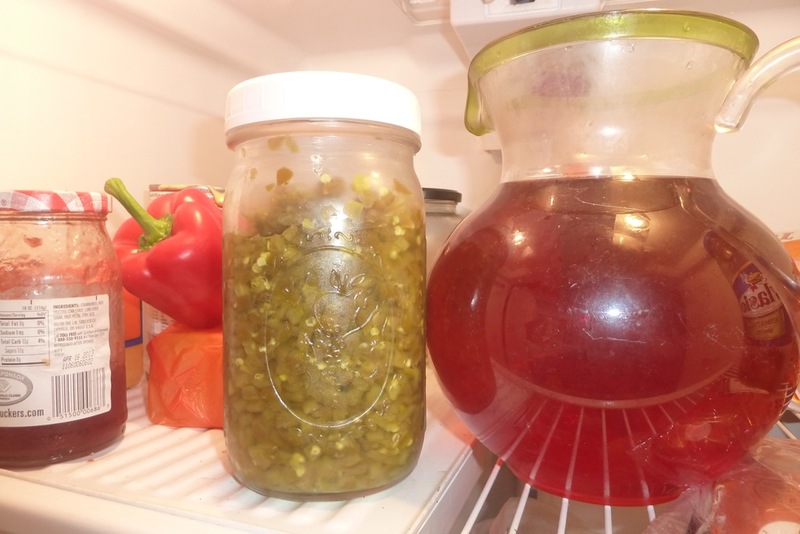 Downsizing a 1/2 gallon jar of Jalapenos helped save space in the fridge. BBQ Sauce stored in the wide mouth Kerr made it easier to dish out at the table, and easer to store in the fridge as well. 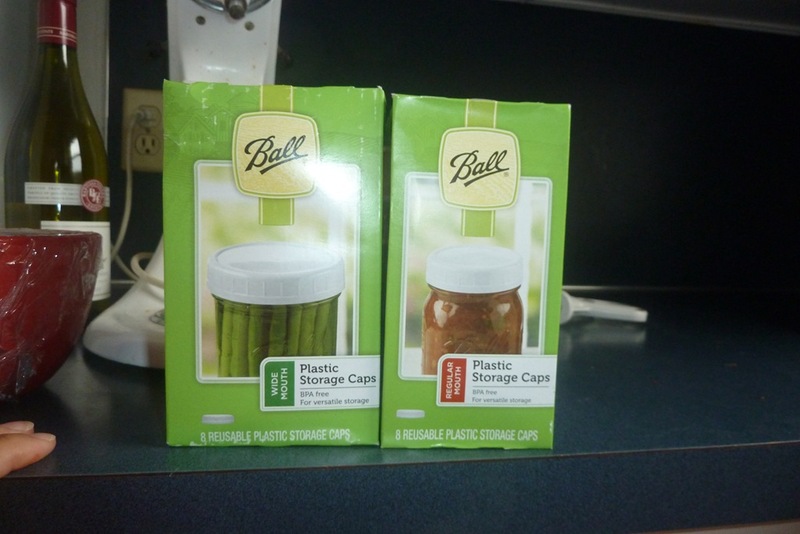 Today I broke down and bought a case of Pint Wide Mouth Ball Jars, Wide Mouth Plastic lids, and regular plastic lids as well. We enjoy using the jars for our drinks – they make great Tea and Water containers. We’ll make a huge batch of Tea, then fill the jars and put them in the fridge. Cool Wonderment. If you don’t have room for Ball Quart or Pint Jars, which was my excuse for not buying them, try going through the shelf/drawer with the mismatched SAHM Tupperware Collection and see what sort of space you could find. Look Here on Monday for the link to this week’s Blog Magazine – The Christian Home. 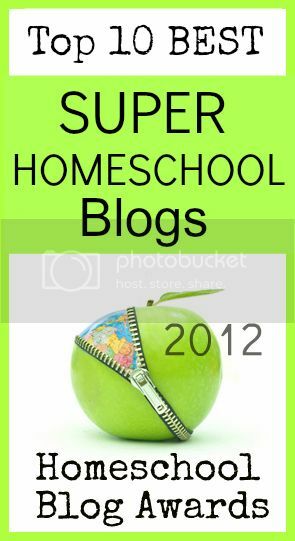 This entry was posted in Some Schooling, The Christian Home and tagged Ball Jars, Christian Home, HomeSchool, Lincoln City. Bookmark the permalink. Love it! SAHM tupperware! I’ve been trying to rid our kitchen of plastic and now have a nice collection of small jars (think Polaner’s All Fruit jars…) for drinking juice and such 🙂 The kids prefer them to the actual glasses we have. Once I get all moved I’m buying a case of jars; all sizes! PS- In our house (er, fridge) just because we can see what it is, doesn’t mean we eat it ;0) like April mentioned: we sometimes rather watch what grows from it 😉 HAHA! Interesting post. I just purchased a set of Kinetic brand containers on sale at T.J. Maxx. They are supposed to keep your food fresher longer, and still be safe (a.k.a. not turn you and your family into guinea pigs for new technology). They have just been washed . . . the next week should be interesting. 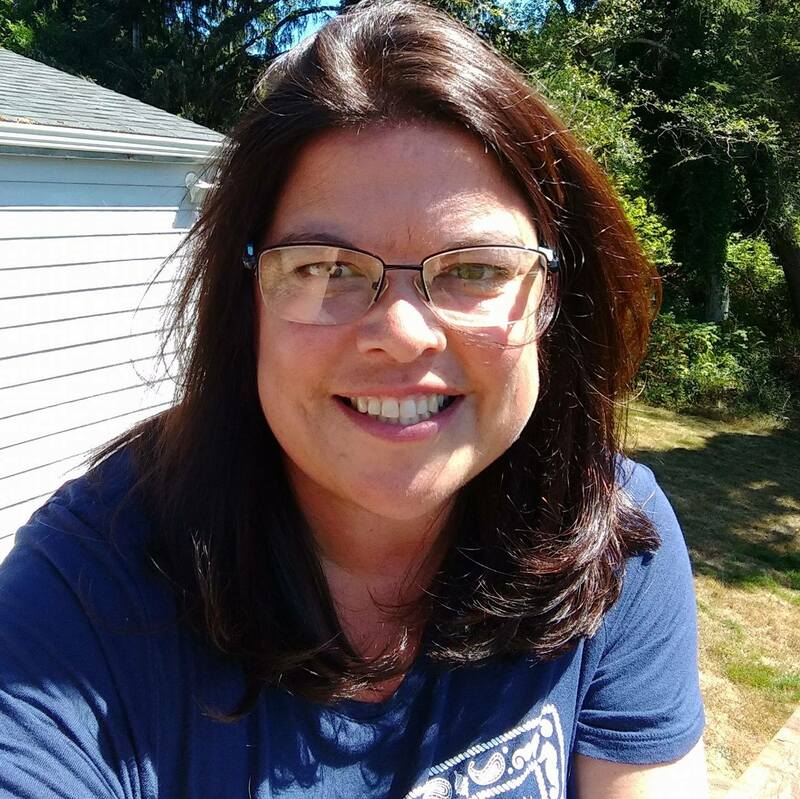 Oh my, my life as wife and mom just reflected so glaringly . . . I find watching my food in the refrigerator interesting. You are brilliant!!! Amazing! I did this not too long ago with grains and such in the pantry but it never occurred to me to do the same in the refrigerator! I am so getting a bunch of jars when I am out this week. I’ve heard this suggested in the past as a way to allow people to SEE what is leftover in the fridge. I just might have to give it a try as we have a ton of ball jars that haven’t been put into use for a while. Instead, they are collecting dust in the garage. What a great idea. May have to try this.